Flirting with DIY | Hi! I'm Rucha. I love all things decor and I'm on a mission to prove that renting an apartment doesn't mean you can't love your home – even on a budget. All it takes is a little motivation, some elbow grease, and a desire to change things to fit your style. Hi! I'm Rucha. I love all things decor and I'm on a mission to prove that renting an apartment doesn't mean you can't love your home – even on a budget. All it takes is a little motivation, some elbow grease, and a desire to change things to fit your style. 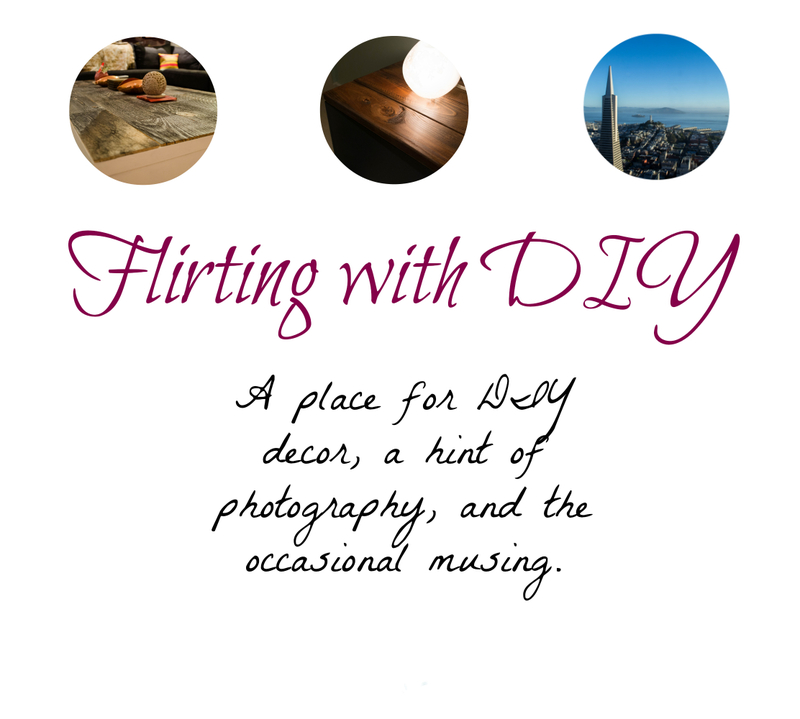 Follow Flirting with DIY on Facebook! I’ve been on something of a semi-self-imposed hiatus the last few months. My new job takes more out of me than I would have guessed, but is also far more fulfilling than I could have hoped for. I also started focusing more on photography, and when you barely have time to make things and decorate, well, it’s tough to run a DIY blog. With the internet, it’s easy to get inundated with links and websites that have too much info to take in. My first concern was running a small business – something that many of you may have encountered or debated doing. I found Kabbage, which offers small business loans to budding entrepreneurs. I truly love their tech-friendly approach, and obtaining the loan is super efficient. Definitely something to consider. Pinterest is always good for DIY/decor inspiration, and I actually love Instructables as well. Don’t do things just for the sake of doing them. I think I mentioned in my last post that I’d sometimes considered working on things just to produce blog content, but those things would ultimately not have made me happy. I love decor and inspiration, but I love utility as well, and I don’t want to flood my living space with stuff that doesn’t have a purpose. Well, except for certain things. Not all decor has to have a purpose. 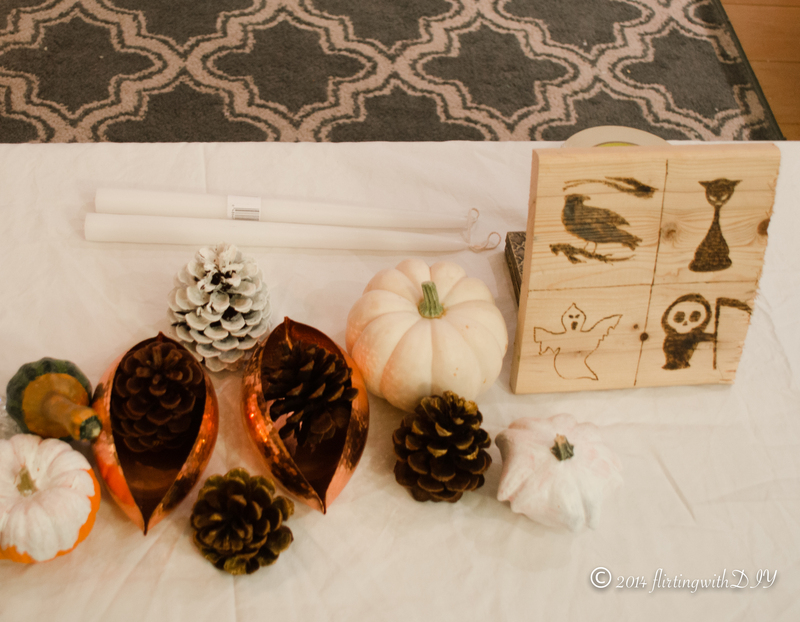 Hello, useless but pretty pine cones and gourds! Life gets busy. And next thing you know there’s craft debris everywhere but you don’t care because you just want to go to bed. It’s important to keep at least one space that’s usually uncluttered, that you can enjoy. Matt and I don’t live in the largest space ever, so we have to make sure we have a living room and bedroom that we can both enjoy. However I now also work from home one day a week, so I’ll be working on sprucing up our desk and creating a mini-home office area for both of us to take advantage of. Whether you love filing folders or virtual ones, having an organization system works wonders for productivity. It allows for prioritization and a hub to put all your ideas, tasks and to-dos in one place. There are great task-management systems out there that help with this – a GTD (Getting Things Done) System and an updated calendar are keys to success. Whether you go on an actual vacation, or just go nap/read/eat in the park without worrying about tasks for one day, remember to take some time for yourself. Work out, hang out with friends, recharge. You’ll come back with fresh ideas and a new perspective, because you took the time to let your brain relax, and you’ll be better for it. Can’t believe it’s the last day of 2014. In lieu of a Wishlist Wednesday post, this one’s a bit of an update. 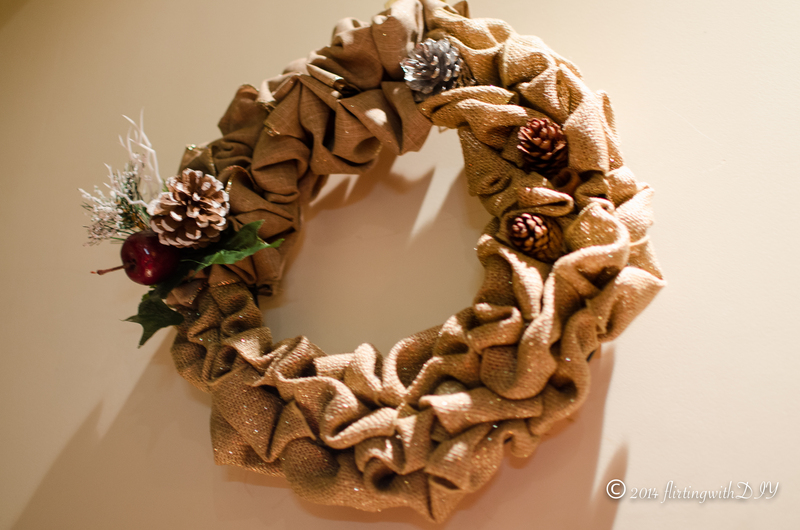 I’ve really loved learning new DIY skills and blogging this year. Blogging was something I started when I was 14, but it was never really something I could regularly keep up with. With a blog dedicated to a theme, however, it’s been a lot easier, though I still don’t blog as often as I’d like. Part of it is not having the time to DIY stuff to, you know, talk about, but another part is that I don’t want to make things and blog about them just for the sake of the blog. That’s a quick way to ruin any interest I have in this whole endeavor. As the year wrapped up, Christmas was definitely an excuse to putter around the house and craft things. Thing is, for the 6 weeks or so leading up to Christmas, I was in the application and interview process for a new job. As you can imagine, it took a lot of my time and energy, and the Thanksgiving trip that generated over a thousand photos just added to my task list. It wasn’t all for nought – I got the job! 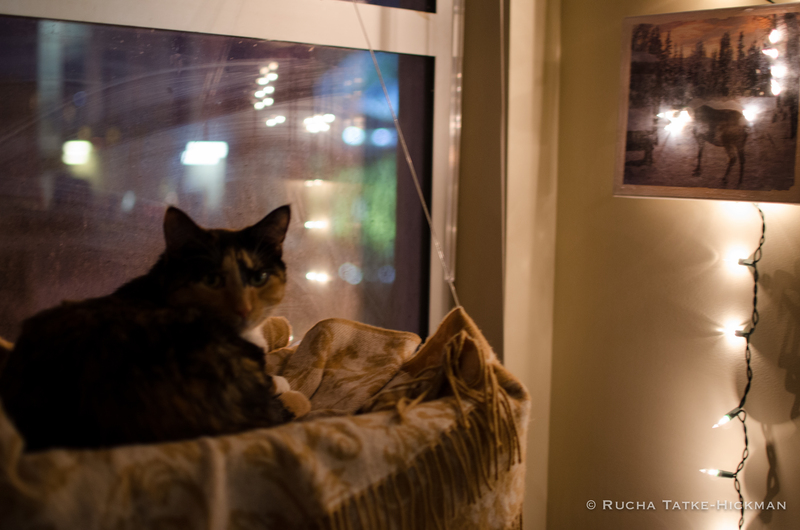 Meanwhile, I also got some pretty Christmas photos of our place and at our in-laws’. 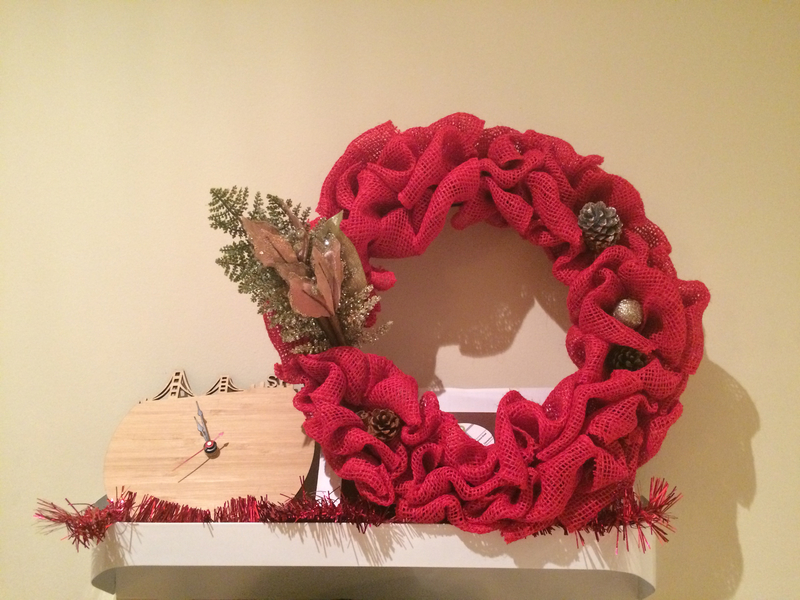 I made another wreath to add festive touches indoors, and I love how this one turned out. I think I might just get into seasonal wreaths. 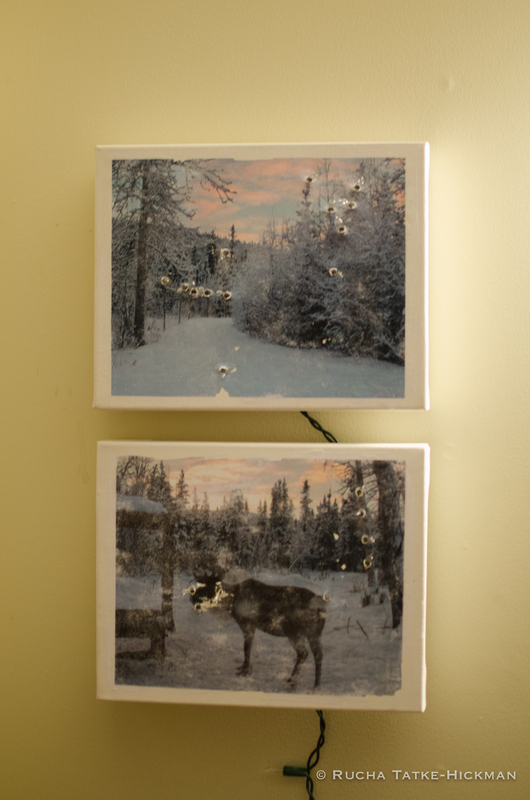 Other than the two wreaths, I did a photo-to-canvas transfer of a couple of photos form Alaska to have some fun with string lights. I poked holes where the lights would go – I didn’t mean to poke so many holes in the poor reindeer’s face, it just happened to be a spot where the transfer didn’t take very well. SO yeah from the front it looks kind of ridiculous. 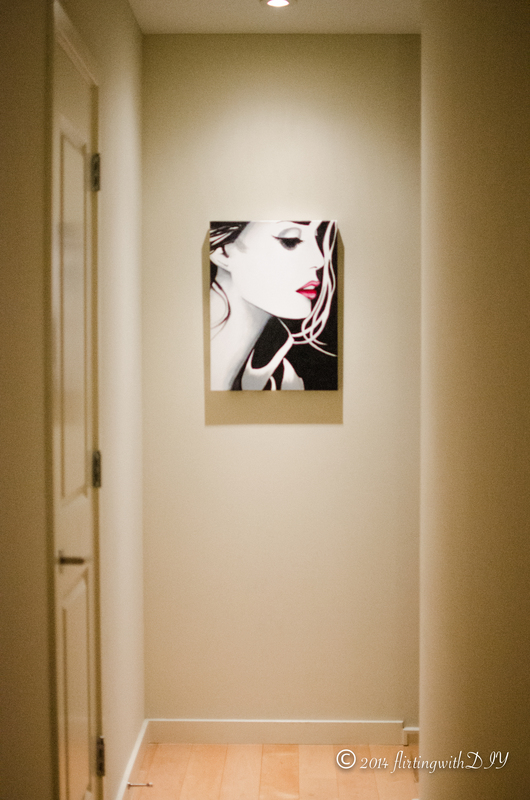 I mainly added the photo to the canvas so it wouldn’t look like a blank canvas hung up on the wall during the day. However, it looks pretty nice from the side, and since it’s in a corner, you don’t really look at it head on. 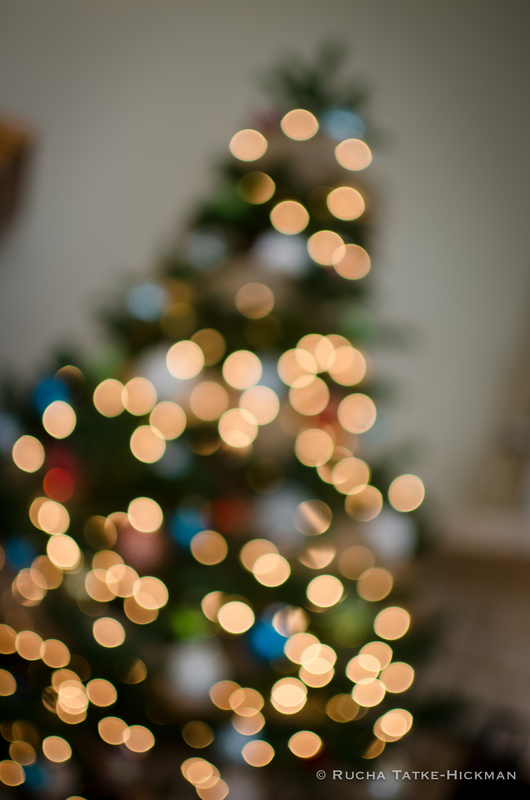 I love lights and Christmas trees really make for great bokeh in photos. So I went a little crazy. 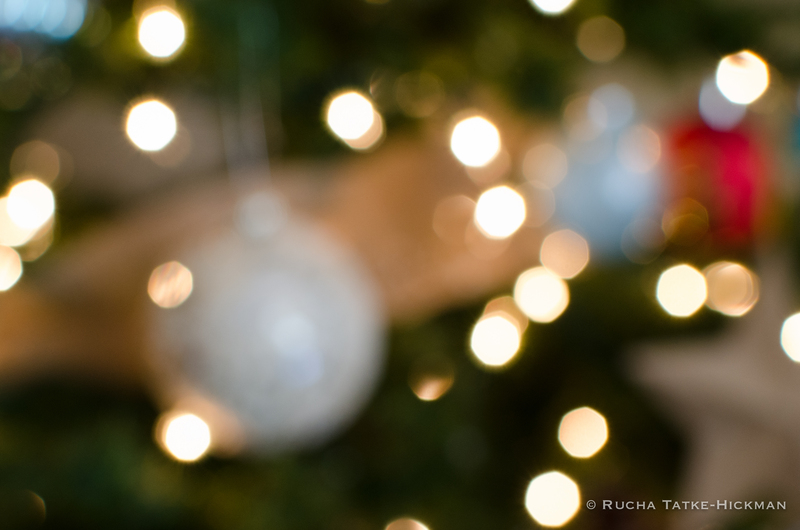 More lights = prettier bokeh. I’ll remember that next year. For this upcoming year I hope to tackle more (and more challenging) projects, and I also plan to dedicate a separate blog to my photography. It’ll take time away from this blog, but it’s something I love doing and want to get better at. So that’ll be my part-wish-part-resolution for today. Have a happy a safe New Year’s everyone! I’ve been thinking about rearranging our living room lately, and one thing that bugs me is our bookcase. Our apartment is pretty decent-sized, but it’s astonishing how much real estate a 2×8 Ikea bookcase can take up. There are definitely some gorgeous bookcase designs out there, but many of them still take up more space than might be ideal. 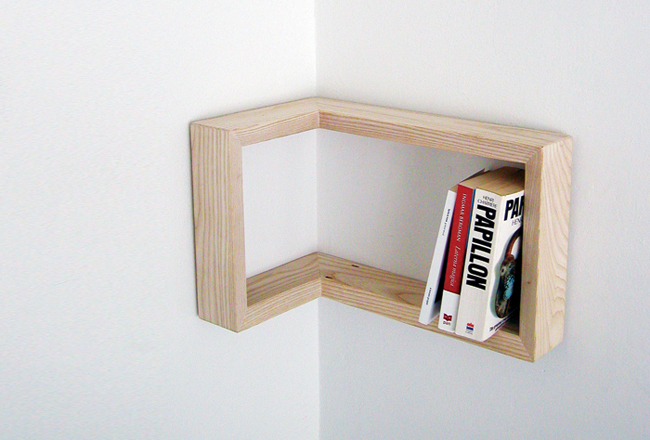 Martina Carpelan, a Finnish designer, has a cool storage solution that I love. The design could just as easily be used in the kitchen or other rooms. What I like most is that you could use it both a positive or negative corner of the room. The downside is, one shelf wouldn’t hold too many books, and at 95 euros a pop, that’s quite a bit to spend. Even so, it’d be cute as a bedside bookshelf – if your room has weird proportions – and it’s also inspiration for a DIY version of your own. Something else that I’ve been thinking of lately, is the large wall in our staircase landing. It’s pretty high, and it’s a lot of blank space to look at, which is rather uninteresting. That’s a shot I’ve been wanting to get for a while now, and I’m considering attempting to DIY a photographic mural if I get the perfect shot. 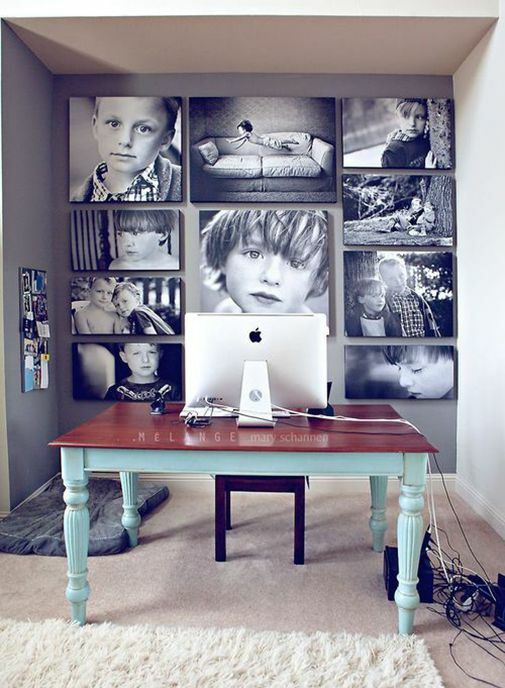 The biggest challenge would be covering a large wall, as well as figuring out a way to make sure it’s removable. The more I think about it, the more excited I am to try this out – so this is going on the project list for sure! It’s hard to believe we’re nearing the end of the year. Maybe it’s just me, but 2014 kind of whizzed by. Since we’re not quite in lets-talk-about-resolutions territory yet, I’ve been trying to add festive touches around the house for the holidays. Matt and I celebrate Christmas with his family and I’ve never decorated for the holidays in my life, so it’s been kind of fun being in entirely new territory. The first thing I did was make a wreath, mainly because our roommate asked for one, and well, they’re just so pretty. I decided to make a burlap wreath that I might just keep on our door year round, switching up the accessories for the seasons. I found various tutorials online, but my favorite one was over at Try On A Homemade Life. It’s really detailed and has step-by-step photos (which, by the way, I tried to do for my own project but the sheer amount of glitter I was shaking off the burlap put a stop to that really quickly). 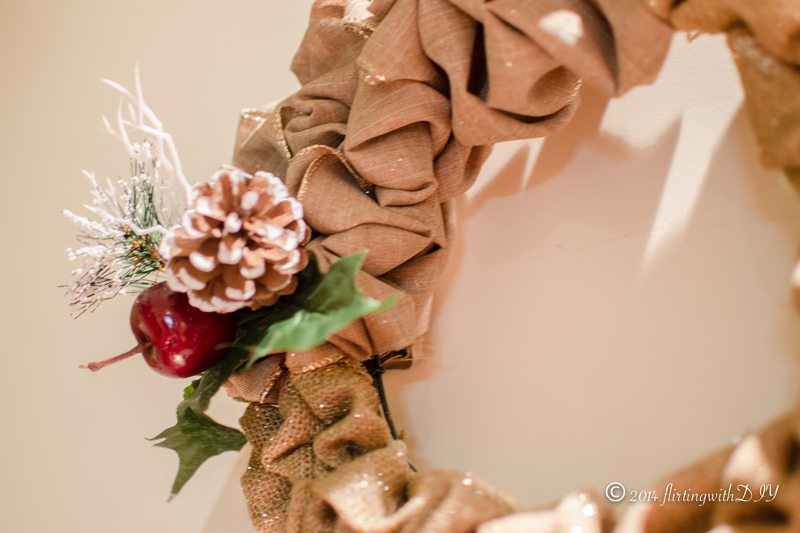 I also picked up some pine cones and other decorations to add to the wreath, and I love how it turned out. I just stuck them in the folds of the burlap, which has worked surprisingly well so far. If you notice, I also used two kinds of burlap, one with a tighter weave. I picked up the two kinds on a whim and my instincts definitely paid off – I love the variation in texture and slight change in color. So far that’s been the most obviously holiday-themed project I’ve done. I used a leftover scrap of burlap to line the top of the bookcase, since we don’t exactly have a mantel, and put my trusty Crate & Barrel LED string lights in a red vase for an easy update. 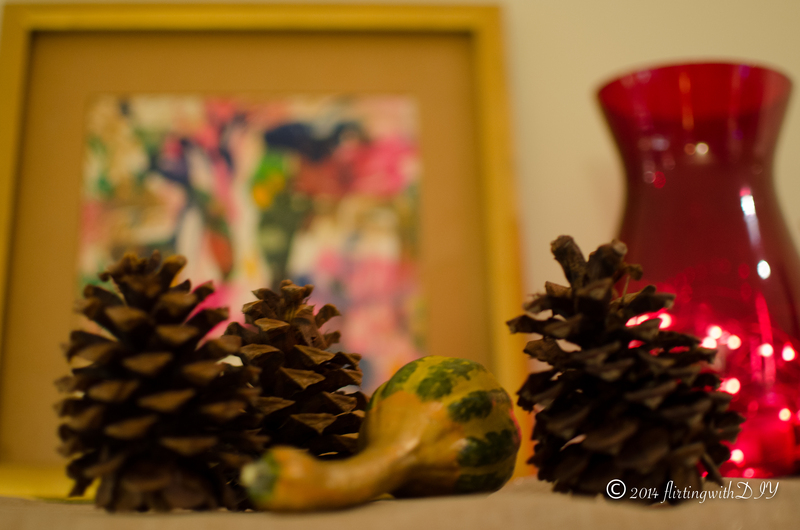 I also have approximately eleventy billion pine cones from when I went shopping for fall decor, so those are scattered around too. 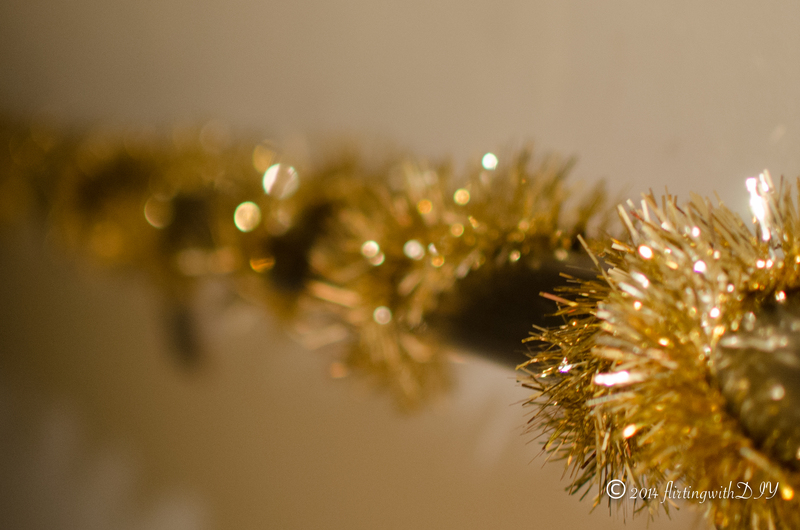 Oh I also got a bunch of tinsel, because you can’t do holiday decor without tinsel. Hey I like glittery shiny things, okay? It made our incredibly regular and boring stairwell look a lot nicer. 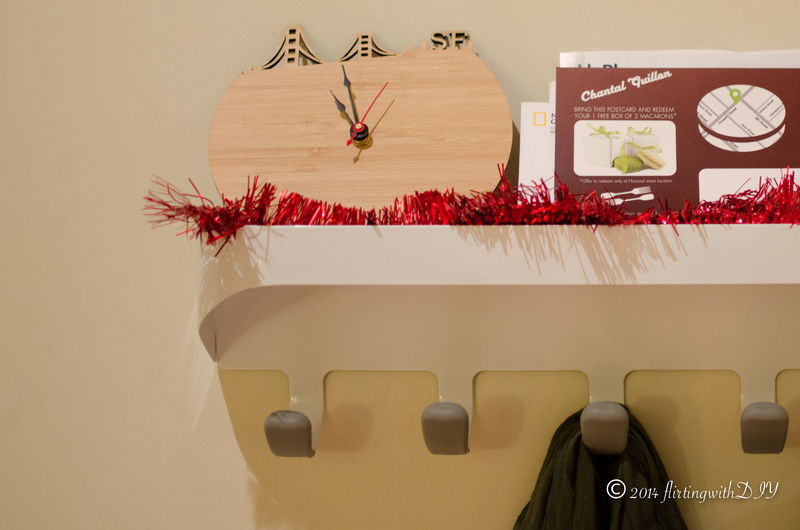 And added some punch to the mail holder/coat rack. There’s definitely more to come (like a tree!) 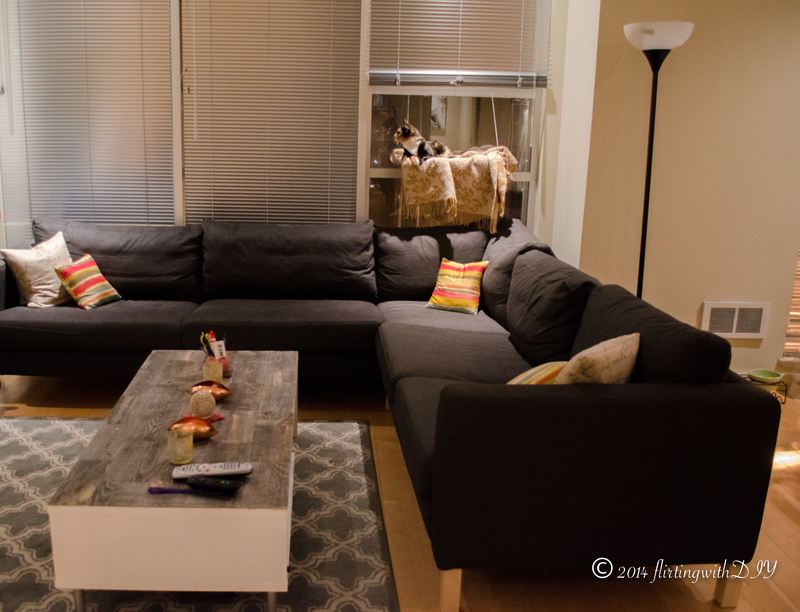 and possibly an overhaul of our current living room arrangement. The holidays are definitely a time for crafting and I’ll post more in the next couple of weeks with projects and updates. Meanwhile, I’m working on more designs as we speak. 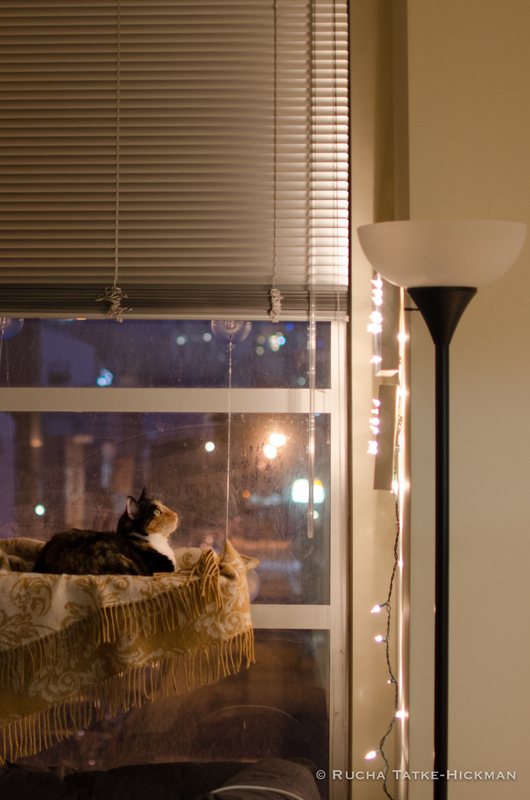 For now, hope everyone’s warm and cozy – and those in the Bay Area getting walloped by rain, stay safe! 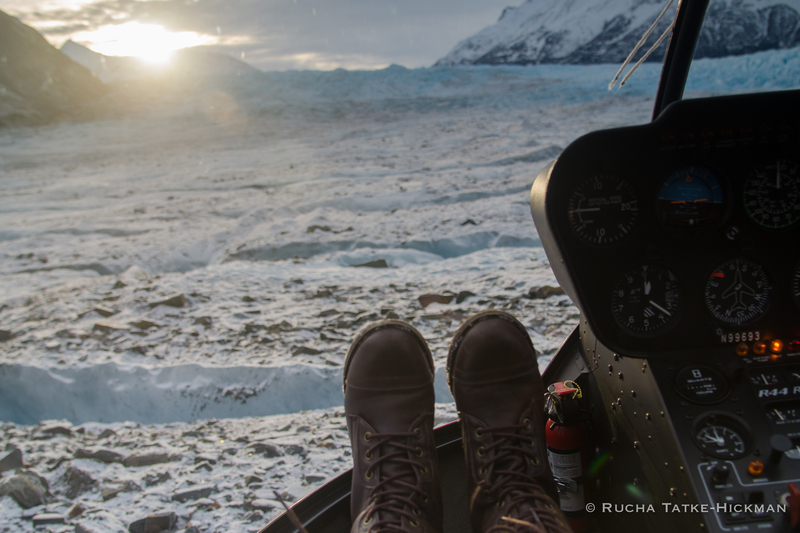 This week’s wishlist is a quickie – mainly because I’m too distracted by Christmas decoration prep, editing my photos from Alaska (which is where we spent all of the week of Thanksgiving) and because I don’t want to distract from the awesomeness that is this item. The door, which also has an industrial-chic version made of solid steel, is the brainchild of Klemens Torggler, an Austrian artist. Also referred to as a “kinetic door”, it’s based on rotating squares that fold and pivot. From what I can tell, there’s no way to lock these so it’s not exactly practical to want one for a main door, but I think it’d make a beautiful interior door. The best part is, Torggler custom-creates these according to the client’s style, so even if you don’t have a place with a really modern aesthetic, this could still work. Here’s the steel door, for example. Maybe I’ll put this on my Christmas list for next year. I usually can’t read “November 5th, 2014” in my head without also going “Remember, remember, the 5th of November…” so for those of you across the pond, Happy Guy Fawkes Day too! In light of this particular day, today’s list will focus on lighting. I mean, I could focus it on fire, but there are very few fire-related items I could keep around without major issues. The Philips Hue System is something I’ve been coveting for a while. It’s an app-controlled lighting system that lets you control the entire house’s lights from your smartphone or tablet. As a tech-happy person, this makes me giddy. 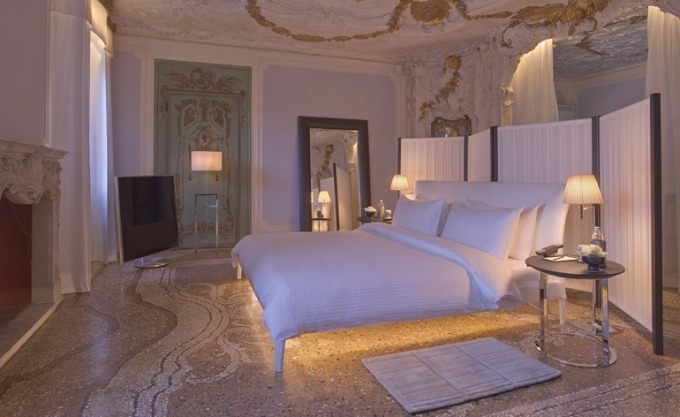 You can program different lights according to your schedule (imagine waking up to a slowly brightening room), preference (hate harsh bright lights? no problem!) and mood (capabilities include a full spectrum of color). 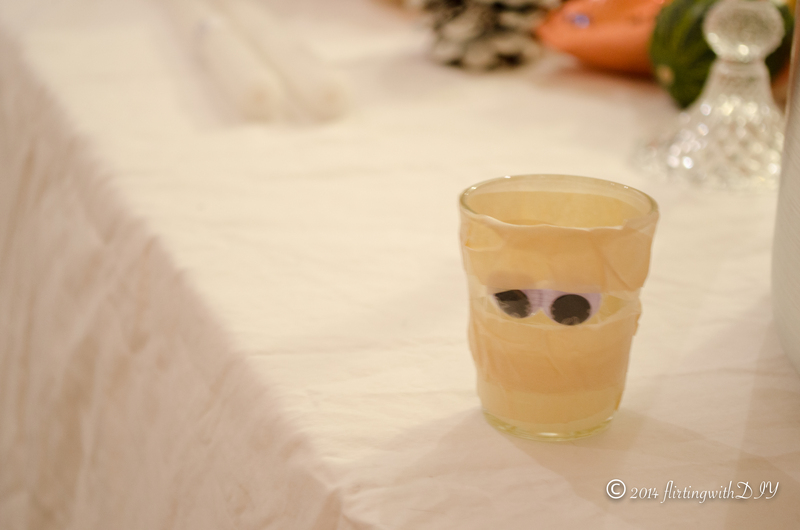 This would have been really useful for our Halloween party, now that I think about it. My favorite aspect is the option to get LED light strips . 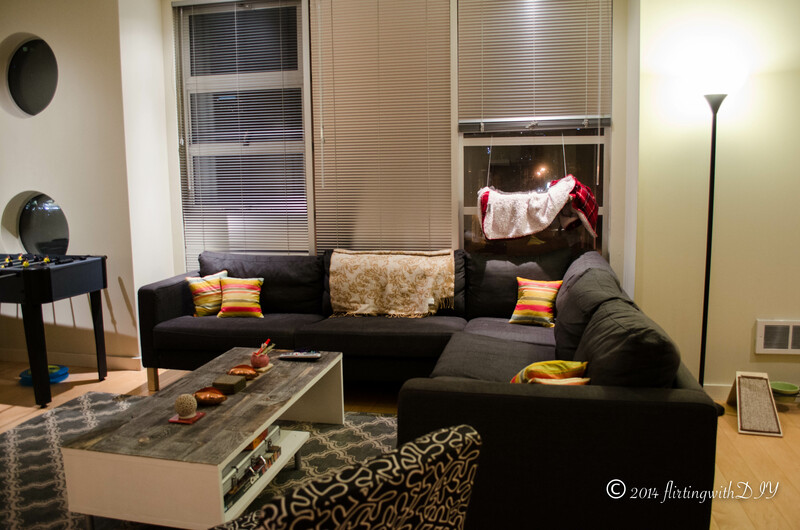 Along with the regular lamps, the photo shows Philips LivingColors Bloom on the right (basically a colorful spotlight you can place anywhere in the room) and the LightStrips are underneath the couch. I love that you can basically customize different parts of the same room according to how you want to arrange the space – which would be perfect for open plan areas. The cost is a little high for lighting – $60 a bulb, and $200 for a starter kit that includes 3 bulbs – but I’d say this isn’t just any lighting solution. I also think these would be perfect for a rental space with less than desirable lighting – but then, I might be biased. Okay, so maybe something a little subtler than “BEER” but you get the idea. I’ve never really featured our bar area because it’s not so much an area as a corner with a bar cart, even though its a pretty nice bar cart. It’d be nice to spruce it up especially since we’re actually pretty proud of the thing. Okay so maybe I have one fire-related item today, but it’s a DIY. 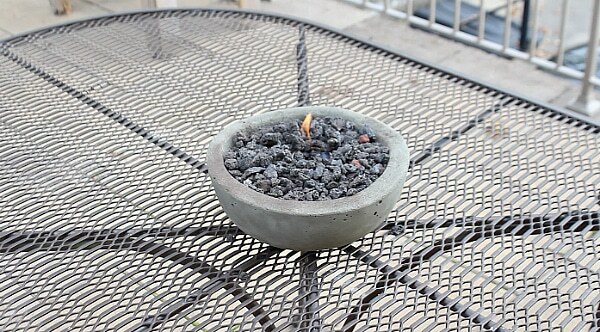 A friend found this awesome idea for a tabletop fire pit on Lifehacker – DIY Gel Fire Pits. The original tutorial is actually on Home Repair Tutor – which by the way, is an awesome resource in general. Since we have a small patio that we share with our neighbors, I’m going to be making this one soon. I hope those in colder climates are starting to cozy up by their fires, and if you’re celebrating Guy Fawkes, stay safe! I hope everyone had a great time celebrating Halloween this weekend – whether you went out or stayed in with your favorite horror movies. I don’t do horror movies (and when I do it’s always a terrible idea), and we had a party to throw in any case. I had a busy week, not least because of the World Series (go SF Giants!) and prepping the decorations. The wood-burning pen that I mentioned I ordered from Darby Smart arrived on Thursday, and I had some fun playing around with it. It takes some practice, especially when trying the different pen tips in the kit I bought – fine point, calligraphy, shading and angled. 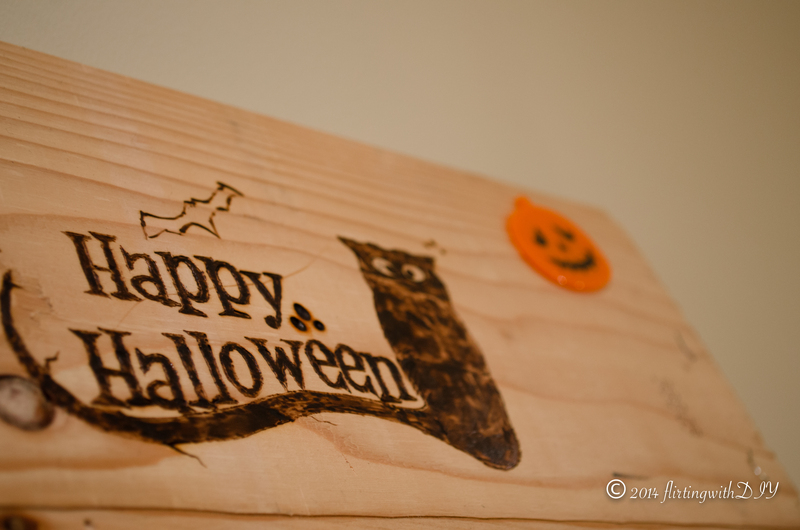 I decided to make a “Happy Halloween” sign on a scrap piece of wood as a test run. 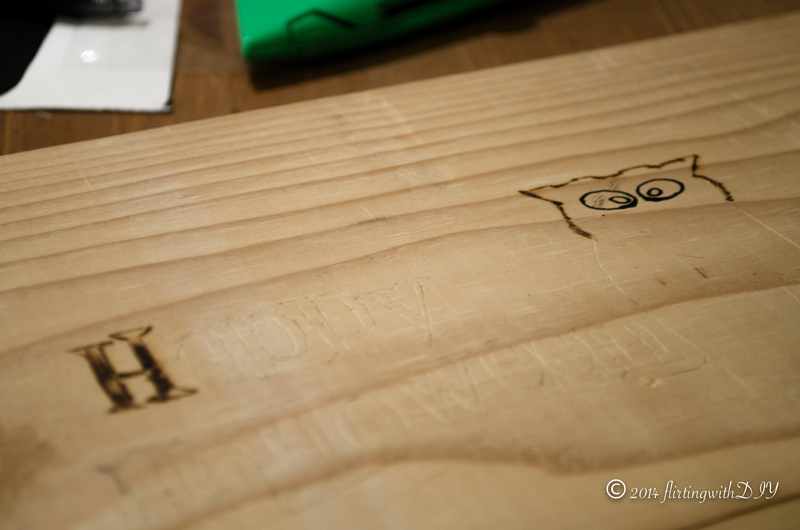 I traced the stencil I found on the wood base with an X-Acto knife – which took forever. In hindsight, I should have done a pencil transfer. I went over the outline with the calligraphy tip, as it had a thicker point that didn’t get stuck in the grooves like the fine point tip would have. The shading and burning took no time at all – I just had to adjust the pressure and length of time I held the pen to the wood according to how dark I wanted the burn, as well as how soft that portion of the wood was. I added a little bat outline for fun, and stuck a silicone pumpkin sticker I found at Daiso. 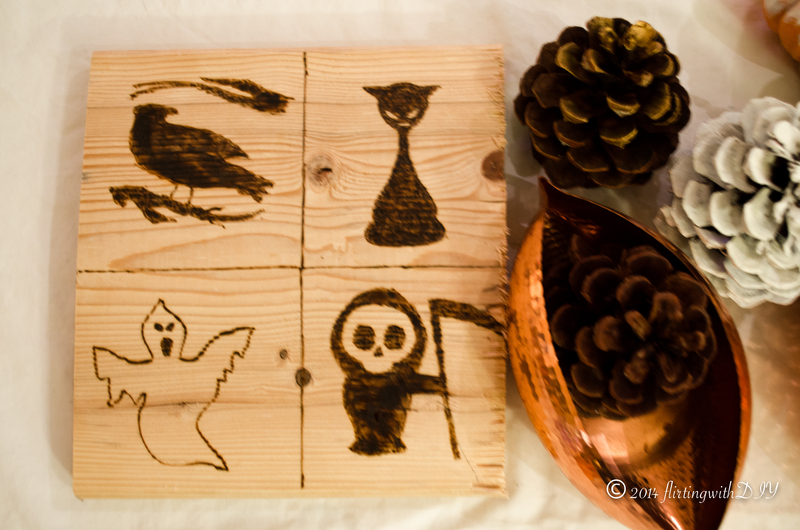 I had a couple other Halloween themed stencils that I found online, and this time I used a pencil transfer. I simply traced and colored in the images on the other side of the paper, pressed that side to the wood, and ran an eraser over the printed image. The pressure from the eraser transferred the charcoal from the pencil onto the wood, which I then ran my wood-burning pen over. My favorite is definitely the adorable Grim Reaper. I also bought some decorative gourds and pinecones, some of which I painted white and others got the gilding treatment with some handy Rub N’ Buff. 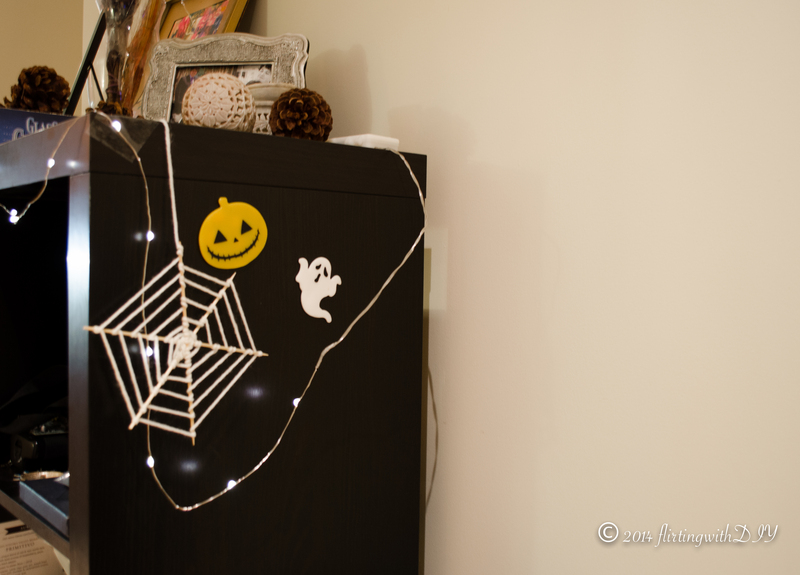 I wanted some decorations to transfer over to the holiday season rather than packing them up for a year, so I didn’t go for any spooky touches. 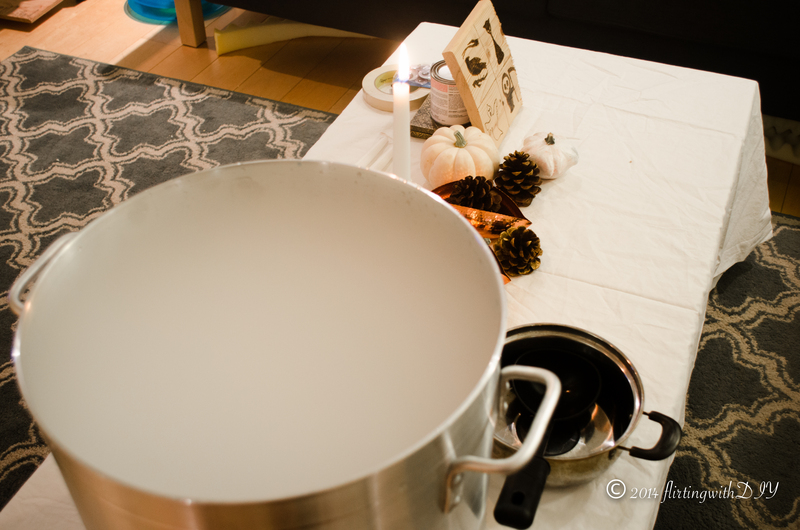 We used up six pounds of dry ice over the course of the night in order to keep the punch bubbling. It was definitely the attraction of the night. I took these pictures before the lights were lowered and people started arrive, so bear with the very non-Halloween-like atmosphere. There was definitely fog juice and a greenish glow involved later on. I did add some fake cobwebs and additional stickers around random corners of the apartment. I made them out of yarn and skewers, and they were inspired by a tutorial over on Small for Big. They were an amusing little touch. 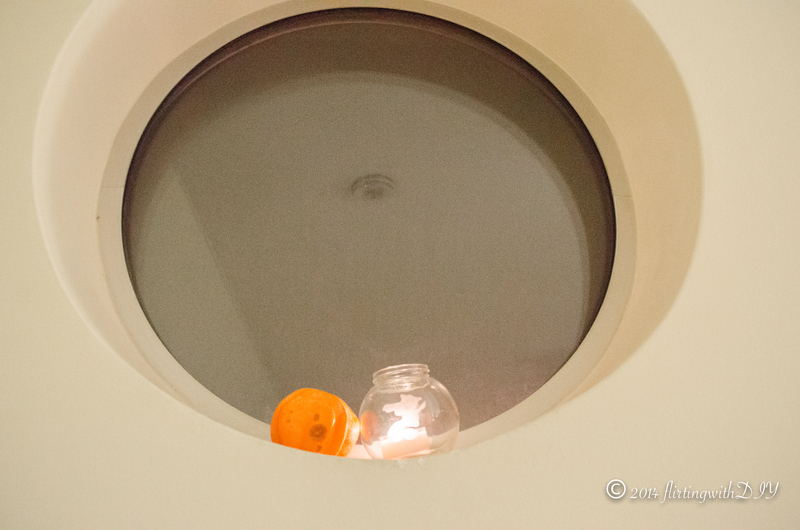 We also have porthole windows in the living room that needed some love. I used some etching cream to frost a witch atop a broomstick onto the jar – it kind of came out a little lumpy because I wasn’t very careful with my stencil, but still had a cool effect with the lit candle. 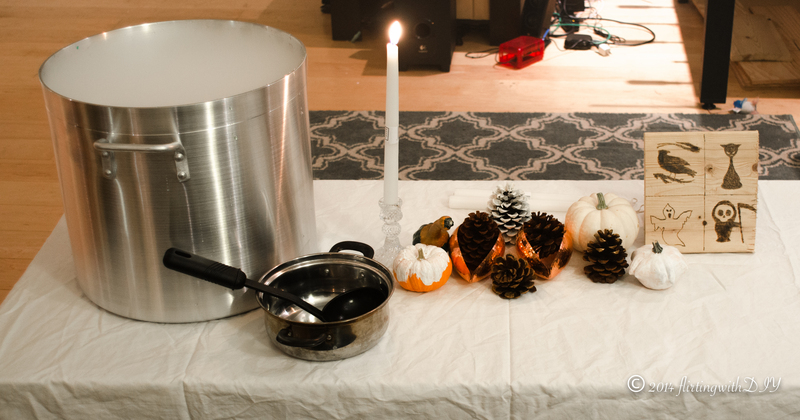 All it took to decorate for our party was some leftover paint, Rub N’ Buff (you could use liquid lead or metal leaf too), etching cream, some skewers and yarn. Well and the stickers and wood-burning pen, but I already had everything else on hand. You have to love simple ideas! 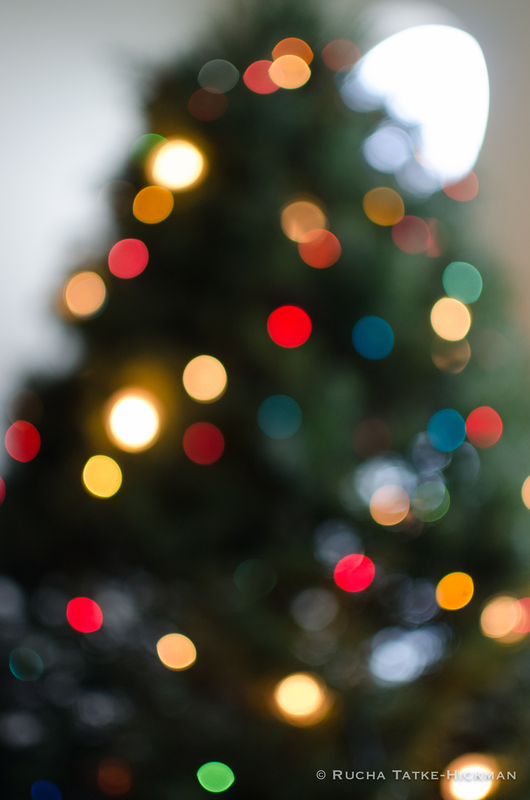 It’s always fun to make some changes around the house, and the holidays are definitely prime time for that. 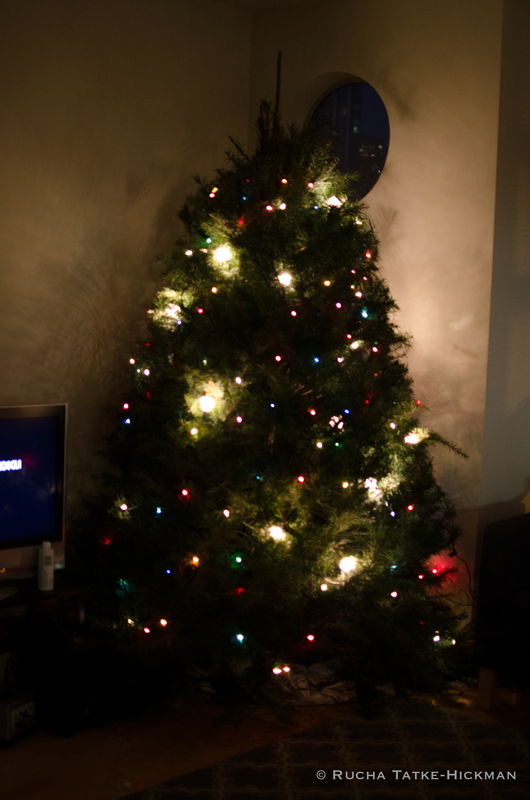 We decided to have a Christmas tree this year, and I’ve never actually had a Christmas tree or decorated one in my own place, so I’m excited. In other news, I’m so happy to say that I’ve been accepted as a designer at Darby Smart. I’m really looking forward to coming up with ideas for projects, this time for others. It finally feels like fall is here in San Francisco. Temperatures are dipping, I’m going to track my scarves down soon, and I actually feel like decorating for the season. Fall is my 2nd favorite season after winter, even though California doesn’t exactly have much of a winter. I love the serenity of snow and the transformed wintry landscapes, and the latter half of the year definitely makes me itch for a place of my own to decorate and change as I see fit. I dream of gorgeous stone fireplaces and cozy baths that I could design according to our tastes. Of course, in my head, that (gigantic, of course) bathroom has natural lighting and creamy grey marble, with that tub as a focal point, maybe with a skylight over it. Clearly, in my head, I’ve also won the lottery. That thing is a whopping $22,310, so this is definitely a wishlist item that’ll stay on the list. But a girl can dream right? It’s beautiful. Maybe one day I’ll have a bathtub that I need to replace and I’ll use it as a guinea pig for an ambitious DIY attempt. I’ll keep you posted – probably via a “What on earth was I thinking?” post. Meanwhile, on the more realistic end of things, I’ve apparently been hiding under a rock because I didn’t realize that Darby Smart existed. I think I might have briefly seen an ad on Facebook – it’s a DIY monthly subscription box – and dismissed it because I wasn’t sure I wanted a prepackaged DIY project coming in the mail every month. I think it’s a really cool idea though, especially if you’re really busy, but like being crafty and making things regularly. What I also realized today is that they also sell supplies and project kits outside of monthly subscriptions – due to which I promptly bought their wood burning set. What I liked about the set is that I could customize to fit my needs, so I eliminated the box in favor of just the pen, stain, brush and letters. I have a couple ideas in mind already, you’ll just have to wait and see! In a similar vein, I’ve been obsessing over the 3Doodler for months. It’s a 3D printing pen that you can use to make sculptures and 3D drawings. The only thing stopping me is that I don’t want it to be a toy that I get and set aside after a gleeful three days, but the more I read their blog, the more I think that with practice, it would be a useful tool to have. Imagine a world where doodling doesn’t waste time, but brings your ideas to life. That bird is made from doodles. Doodles, you guys. It’s like my bored-10-year-old-doodling-in-class’ ultimate dream come true. Seriously though, I think I might get the 3Doodler in the next year or so – I’ve seen some mixed media ideas that I feel could be incorporated into a decor project, but it would definitely be a really unique way to attempt home decor. It’s plastic, and it’ll be hard to make it look pretty, but half the fun is experimenting and facing a challenge. If anything, I’ll have a way to make Halloween decorations next year. Half my time on my computer – assuming I’m not doing work, reading Buzzfeed or watching Netflix – is spent looking around different corners of the internet for design inspiration. It isn’t always about interior design or decor, or about DIY; some things I find are amazing innovations in architecture, beautiful paintings and new art and photography. Some of these things are pretty to look at or inspiring to read about, but others also have me thinking of new ideas to play around with. Sometimes those ideas also get tucked away only to be remembered months later, but that’s a different story. But part of finding a cool thing is being able to talk about it. I’ve toyed with blogging about finds before, but I realized that a lot of things I look at or covet – I don’t necessarily covet for myself. They’re just cool, or things that someone else might love in their home. Which is how Wishlist Wednesdays became a thing in my mind. I don’t want to talk about stuff I want for myself – mainly because half the stuff I want, I’m not going to buy. Our apartment is sadly not a magical bottomless pit, nor is our bank account. I mean, I don’t really need that pool table that converts into a dining table as needed. Maybe. In any case, that won’t stop me from window shopping, and maybe someone else might stumble upon a post and see something they like. Yesterday I posted about a gorgeous new painting gracing our home. In light of that (and in the spirit of supporting artists), I want to put the spotlight on two artists whose work I absolutely love. The first is a 5 year old girl. I’m sure a lot of people might have seen articles about Iris Grace, an autistic girl in the UK who does some incredible work with the companionship of her gorgeous kitten Thula. It’s a match made in cuteness heaven. All her work is skillfully layered and yet avoids being muddy. I’m pretty fascinated, and definitely biased towards the Impressionist-like style. I urge anyone reading this to at least read Iris Grace’s story, and if possible, support the work her parents are putting into raising awareness about autism. Forman’s paintings also highlight climate change concerns, and it’s great to see that she’s involved in the cause. I love reading about unique people and interesting backgrounds, and these two artists have been on my radar for a couple of months. I can’t wait until I can showcase some of their work in my home. Okay, so I never intended to go anywhere. After stressing over the headboard project, I took a little breather that snowballed. And since I’m not renovating or redoing a house that I own, it was easy to not feel any urgency. There were a couple of tweaks along the way, and some days, the small things are the ones that make you the happiest. 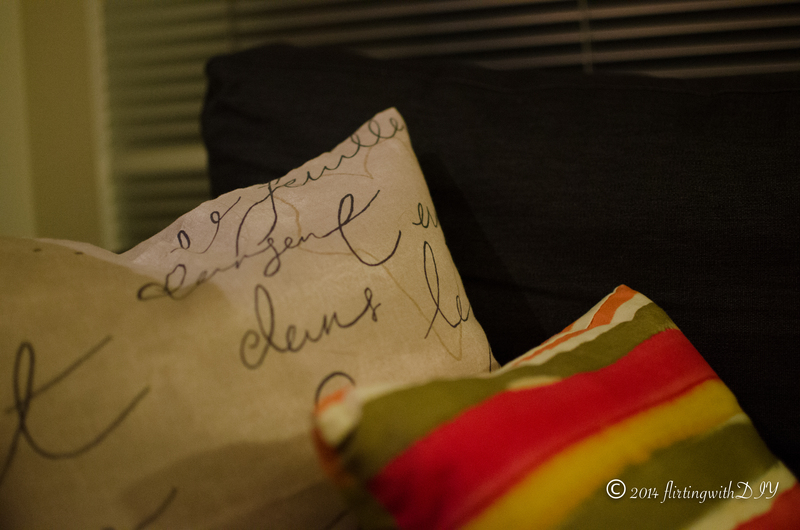 When I last posted about the living room, one thing was nagging at me – how much red was in the room. The copper candle holders, the red coaster, the five bright pillows and the red blanket – they really amped up the red in the room. The size of the pillows wasn’t really making me happy either, they were too small by themselves. So I used two of them pillow forms for decorative bed pillows to complement the new headboard, and bought a couple of larger pillow inserts for the living room. I knew I wanted something neutral for those – between the slate blue of the rug, the remaining pillows and the decorative accents, there’s a fair bit of color going on around the seating area that I wanted to tone down. Luckily, I had leftover fabric from the (rather poor) upholstery job on my desk chair, and it was perfect. I love the script, and I think the style complements the weathered wood on the coffee table. 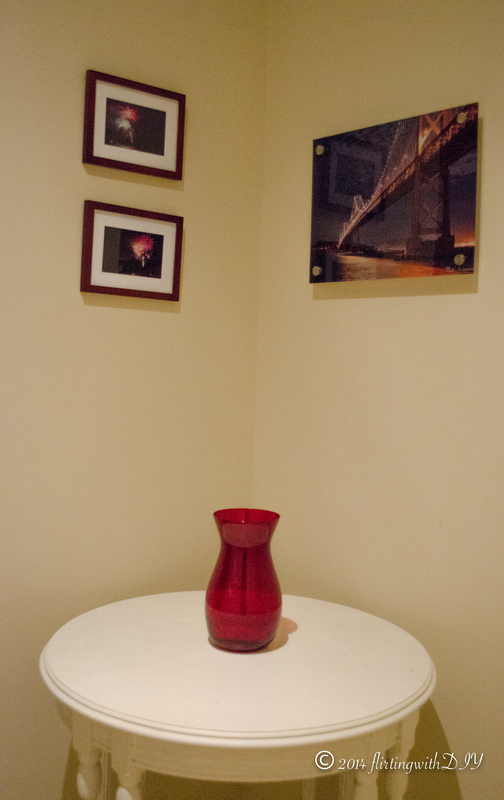 The downstairs nook also got a bit of a refresh, with two new photos – fireworks that I captured on the 4th of July. You can get a better look at one of them here if you like. See the Bay Bridge photo (taken by Matt!) here. She’s beautifully painted on canvas and I just had to have her. 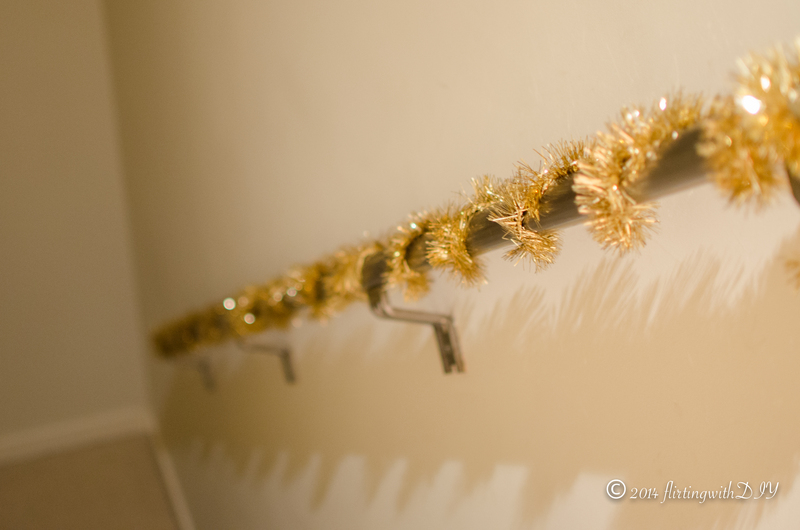 Plus, our once sad and lonely hallway now has some punch. I said before that we needed more art around the house. But I want to take my time to collect pieces that are unique and that Matt and I both love. This painting really what spurred me to blog again after my inadvertent hiatus. It’s been a bit of a balancing act between work, my social life, the projects, and keeping myself healthy and happy. But the little things are as worthy of a place on this blog, as the larger projects – something I should keep in mind. Hi! 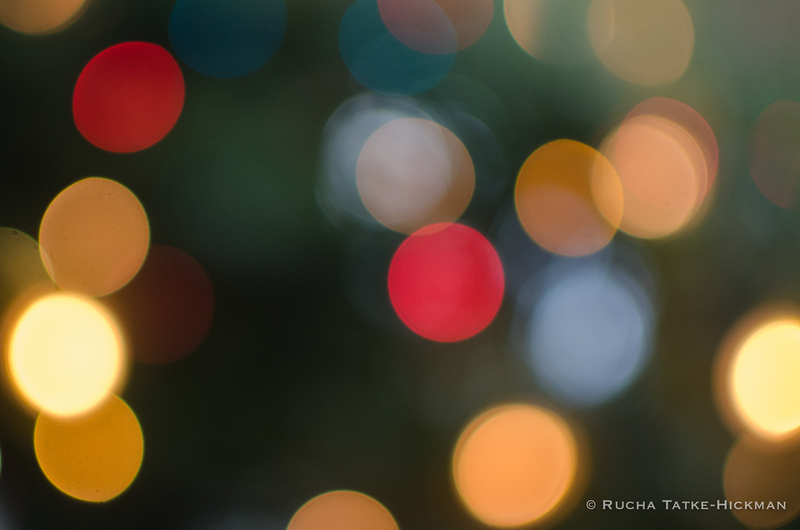 I'm Rucha. I love all things decor and I'm on a mission to prove that renting an apartment doesn't mean you can't love your home - even on a budget. All it takes is a little motivation, some elbow grease, and a desire to change things to fit your style.